Image Credit: Stereoscopic view of "Fort Victoria 1842", a decorative arch modelled on Fort Victoria, erected for visit of the Governor General, the Marquess of Lorne, 1882. Richard Maynard. BCA I-51980. People from a wide range of national and cultural backgrounds have enthusiastically embraced their chance to celebrate and welcome the royals. Elaborate arches were constructed in the towns and cities along the tour routes and bore bearing banners proclaiming slogans like “God Save the Queen”, “Loyal Hearts, English Homes”, and “Dominion Forever”. 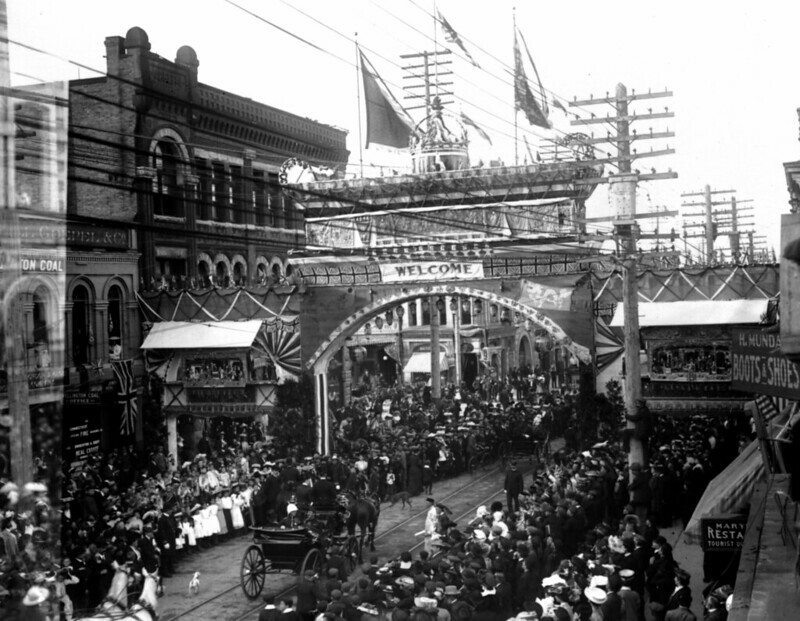 Looking north at the Chinese arch erected at Store Street and Cormorant (now Pandora) Avenue, for the visit of the Governor General, the Marquess of Lorne, and Princess Louise, Sep 1882. Richard Maynard. BCA A-05978.